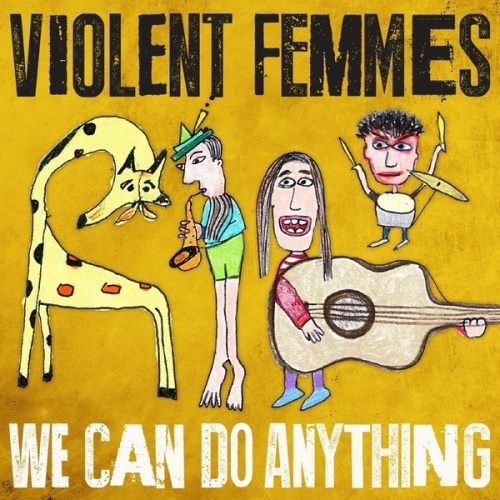 The Violent Femmes spent the bulk of the 21st century either touring their old hits or suing each other over the proper royalty payment of said hits. Gordon Gano and Brian Ritchie buried that hatchet in 2012 and reunited the following year, losing drummer Victor de Lorenzo after those 30th anniversary concerts -- but the pair soldiered on, recording We Can Do Anything, the band's first album of original material in 16 years, with Dresden Dolls drummer Brian Viglione. We Can Do Anything doesn't bear any signs of outright animosity: Gano sounds as twitchy as ever, always poised on the brink of apoplexy, either at himself or some piece of nonsense, while Ritchie shouts back in solidarity or sarcasm. The years have turned the Femmes' rare ballads into something sweet and bruised -- "What You Really Mean" is as romantic and affecting as this group has ever gotten -- and that functions as a nice counterpoint to the numbers where the geekiness feels studied, pushing the tunes toward the realm of novelty. This delicate balance of tone always proved to be a problem for the Violent Femmes -- declarations of angst and galloping cowboy numbers begin to curdle past their sell-by date -- but even if the middle-aged Gano and Ritchie can't resist the clarion call of drunken sea shanties or tunes better suited for a kids records, they do know how to use their craft to not only sharpen the songs themselves, but the record. Even when things get silly on We Can Do Anything, the silliness blows on by, headed toward a bit of revved-up folk or unexpected introspection, and those twists are what makes the album worth hearing.